There is a great affection many Australians have for Storm Boy, it is arguably one of the greatest Australian stories of all time. When I first joined Barking Gecko as Artistic Director, I thought of all the stories that stayed with me from childhood. Storm Boy came straight to mind. I loved the idea of living on the beach, not going to school and having a pet pelican. Approaching its 50th anniversary, the characters are timeless and the story of loss and friendship is still poignant today. My vision is to reintroduce this classic Australian story to a new generation and for those that know it, to fall in love with it all over again. Why do you think people are so nostalgic about this story? For many reasons. It was a story that you grew up with, a story that connects you with a time and place in Australian history. For me, it is a representation of an era and time of growing up. Uniquely Australian, Mr Percival is one of the most famous characters in Australian literature. The friendship between Storm Boy and his beloved bird resonates on a level that is innocent and true. We embrace the loyalty of Mr Percival and we feel the tragedy of the loss. Who will enjoy this show? This story knows no age. 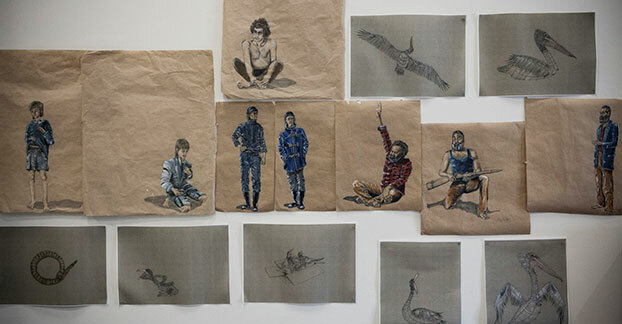 It explores themes of belonging, connection to the natural land, alienation, marginalization, loss, respect and friendship. It reaches all ages, cultures and experience. What are you excited about with this production? I'm excited about partnering up with STC in bringing to life one of my favorite pieces of Australian literature. Also to be collaborating with some of the most talented creatives this country has to offer, including one of Australia's best voices in playwriting, Tom Holloway. I think it is quite fitting that a story that is uniquely Australian in its setting will be premiering on a wharf in the Sydney Harbour. What is your view of theatre for young people being created in Australia at the moment? Having just returned from overseas attending three different festivals in three different continents, demonstrated we here in Australia have an approach with theatre for young people that is neither patronizing or watered down. There is bravery in theatre being created for young people, certain risk taking in the stories explored and aesthetically the production values are world class.